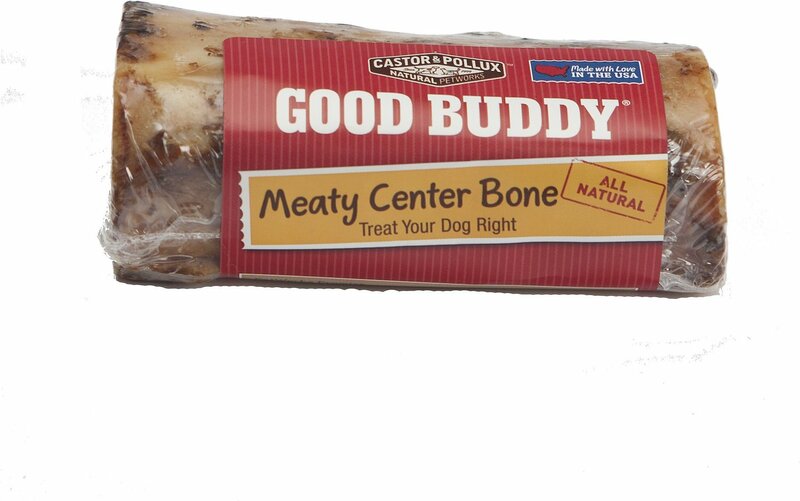 Good Buddy Meaty Center Bone is a high-quality beef femur bone dipped in natural liquid smoke and baked. Its natural meaty center provides hours of chewing enjoyment! The bones are carefully prepared to ensure they are both safe and tasty. Strict guidelines apply to the cooking process to ensure a moist, quality bone that reduces the chance of splintering. The natural liquid smoke penetrates the bone with extra flavor, is an antioxidant, and fights off bacteria. If this product splinters or develops sharp edges, throw it away immediately for your pet’s safety. To prevent injury and choking hazard, please watch your pet while they enjoy this treat and be sure to choose the appropriate size chew. Please provide plenty of fresh water when giving any chew or treat. Because this is a natural treat, its sizing, color and appearance may vary—this is normal. You may also notice a natural scent and oil while your pal chews; this natural oil may stain your furniture, carpeting or other surfaces. Every dog chews and plays differently, so they should always be supervised. Because of the variety of jaw strengths and chewing aggressiveness and enthusiasm, it is important to give the appropriate size bone to your dog — Medium for small to medium dogs and Large for medium to large dogs. Giving your pup delicious high-quality treats is a surefire way to earn his love and devotion for life. Good Buddy believes that all dogs are good dogs that deserve nutritious rewards any time there's an opportunity. These snacks can be given as motivation for learning a trick, to say "good job" when they're well-behaved or just because you love them! Hearty and full of flavor, Good Buddy Jerky Strips are made with real chicken or salmon as the first ingredient, with a side of sweet potatoes for an extra-special treat. Dogs can't resist the robust, wood-smoked taste and chewy jerky texture, and there's no grains, corn, wheat, soy or any ingredients from China. There's no need to fire up the grill when you want to treat your pup to the taste of real beef or turkey. Natural beef or turkey is the number one ingredient in Good Buddy Prime Patties, followed by wholesome sweet potatoes—cooked into savory medallions of pure deliciousness. Real-meat treats are always a favorite with dogs. Good Buddy Sausage Cuts delivers exactly what they crave with protein-packed bites of wood-smoked chicken or beef. This healthy, grain-free snack has no added fillers, poultry by-products, corn, wheat, soy or artificial flavors, colors or preservatives. Keep your little (or big) buddy's teeth sparkling clean with grain-free Good Buddy Dental Chews. With a unique texture in a bone shape, these easy-to-digest chews help freshen doggie breath as they fight plaque and tartar, and they come in two sizes. They're all-natural with no gluten, corn, wheat, soy, sorbic acid or sodium copper chlorophylin. There's a Good Buddy Rawhide Chew for every pup, with options like braided sticks, chips, traditional bone shapes, curls, mini rolls and even pretzels. Sourced and manufactured entirely in the USA, these rawhide chews are made from 100% beef that's basted with natural chicken flavor for another layer of deliciousness. As your dog chews, they help clean his teeth and gums, too. These are the best bones ever! I give my guys primarily Castor Pollux products be it smoked bones or rawhide. I have severe chewers and those dogs that don't chew too much.ironically enough I have a male cat who likes to chew as well and he loves the rawhide. These products are natural sourced and made in the United States therefore much safer. The description says "Good Buddy Meaty Center Bone Dog Treats". When mine arrives there was not "Meaty Center". The center was completely empty, hollow. The outside looks like the picture so it looks good. However, the inside is false advertising...nothing there at all. There's no meat inside whatsoever. Not sure why it's advertised that way. I got the small/medium. Maybe just an accident? My dogs love these. It keeps them out of trouble for a long time. Ordered the small bone for my dog and when it came there was no meat inside. I expected at least some meat but nope, when i look in the middle i can see through to the other side. A bit disappointed because i was debating whether to buy this or the bone marrow product. I don't think i will be buying this again. Max loved this bone!!! The flavor must be lasting as he continues to chew on it a few times a week!! We bought this for one dog but all three fought over it! Definitely a hit! Was to big for my small dog. My dog didn’t want it cause it was too big for her, but in the past, my bigger dogs loved it! Would have given 5 stars but sometimes they do splinter. But much less than other similar products. After they've chewed all the good stuff I spread peanut butter around the ends & freeze them.... another tasty treat that makes these bones economical using them over & over ..
My dog loves these bones & they keep him busy for days.